20 November 2007 (ABC News in Science, Reuters) – A new study in the Proceedings of the National Academy of Sciences reveals the existence of an extensive interaction network involving Taiwanese jade (nephrite) as far back as 5,000 years ago. The jade artefacts turn up in Taiwan, Vietnam, Thailand, Malaysia and the Philippines (where it is known locally as lingling-o). Using a newly-developed process to analyse the jade, the study found that 116 out of the 144 artefacts came from the same source in Taiwan. The predominant source of jade in Taiwan, coupled with the distribution of the jade artefacts throughout Southeast Asia and their relative uniformity of the artefact types, leads to the conclusion that there must have been an extensive degree of interaction between different Southeast Asian populations, even across the sea. What’s left now is to uncover the technique used to create the jade artefacts. Experimental archaeology, anyone? The network, which traded in Taiwanese jade, has been uncovered after mineral analysis determined the source of jade used in two types of earring. Lead researcher Hsiao-chun Hung, of the Australian National University in Canberra, says since the 1930s archaeologists have noticed two very specific styles of ancient jade earring common across Southeast Asia. These are the three-pointed, so-called lingling-o earring, and the double-headed animal ear pendant. Hung says mineral analysis of a number of these has shown most are made from Taiwanese jade. Her finding overturns the long-held theory that the earrings originated in northern Vietnam and spread to the Philippines and Taiwan. It also suggests, she says in the latest Proceedings of the National Academy of Sciences journal, the existence of a small group of highly skilled jade craftsmen who carried or acquired the jade from Taiwan. They then travelled the region, with or without the help of transporting middlemen, making “extremely uniform jade ear ornaments to suit the demands of the local elites”. As part of the study, Hung and her colleagues created a mineralogical database for nephrite deposits in regions across East Asia and the Pacific. Nephrite is one of two minerals, the other is jadeitite, that are commonly known as jade. 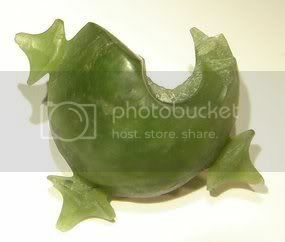 And it is the nephrite that’s found in artefacts studied from Taiwan, the Philippines and Vietnam. The team developed a way of identifying Taiwanese jade based on the mineral chemistry of the nephrite and the zinc chromite inclusion minerals. Of 144 jade artefacts from 49 sites the researchers analysed using non-invasive scanning equipment, 116 specimens from 38 sites were made from Taiwan jade. “This is very strong evidence that ancient populations in different regions had very frequent contact and communication,” says Hung, of the university’s Department of Archaeology and Natural History. She says this shows contact between Taiwan and the Philippines stretches back 4000 years. Hung says the findings also help in understanding how skilled and technologically advanced the populations were at that time. The ear ornaments, which were highly valued by the elite, required high levels of skill, but also considerable labour input, she says. Hung says experimental archaeological research has shown eight hours of sawing jade using a stone knife and sand creates a groove only 11 millimetres deep. And one hour of drilling using a hollow bamboo with sand and water cuts only 10 millimetres below the surface. “We are very sure they had no iron tools,” Hung says. Hung says she will now try to understanding the production techniques and how items such as bamboo drills and slate cutting tools are used. Over 100 ancient jade artifacts in museums across southeast Asia have been traced back to Taiwan, shedding new light on sea trade patterns dating back 5,000 years, researchers said. Using X-ray spectrometers, the international team of scientists analyzed 144 jade ornaments dating from 3,000 BC to 500 AD and found that at least 116 originated from Fengtian in eastern Taiwan. “The chemical composition of jade reveals its origin and … their analysis determined the relative amounts of iron, magnesium, and silicon in the jade,” the scientists wrote in a paper published in the latest issue of the Proceedings of the National Academy of Sciences. Fengtian jade has a distinctive translucent green hue and black spots. The 144 artifacts were unearthed in archaeological excavations in Taiwan, the Philippines, Malaysia, Vietnam, and Thailand. Odds and ends of Fengtian jade were found at several sites in the Philippines, Thailand and southern Vietnam, which the lead researcher Hung Hsiao-chun said may have been workshops. “Fengtian jade was shipped to these workshops in southeast Asia, which dated from 500 BC to 100 AD. They were very small and they churned out these ornaments that were then exported to other places,” said Hung, of the Australian National University in Canberra. “What’s really interesting is their products (from different countries) were very similar,” she told Reuters in a telephone interview. Jade earrings, beads, bracelets and pendants, some depicting two-headed animals, were popular in southeast Asia during the early Iron Age between 500 BC and 500 AD. Prior to this period, however, Taiwan’s jade ornaments were likely to have been crafted back home in Fengtian. “There was a very huge workshop in Fengtian, dating back to 3,000 BC,” Hung said, adding that one of the earliest pieces of Fengtian jade found in the Philippines dates back to 2,000 BC. The findings of Hung and her team revealed one of the largest prehistoric trades in semiprecious stone. “Their seafaring methods must have been very superior, even back then,” Hung said. Next Post: Wandering craftsmen behind jade working?